Shoot! I should have taken a pic before I replaced the old desktop. Welp? The old desktop was a tiny sewing table that I found on the side of the road. It worked but it was too small and wicked tall! 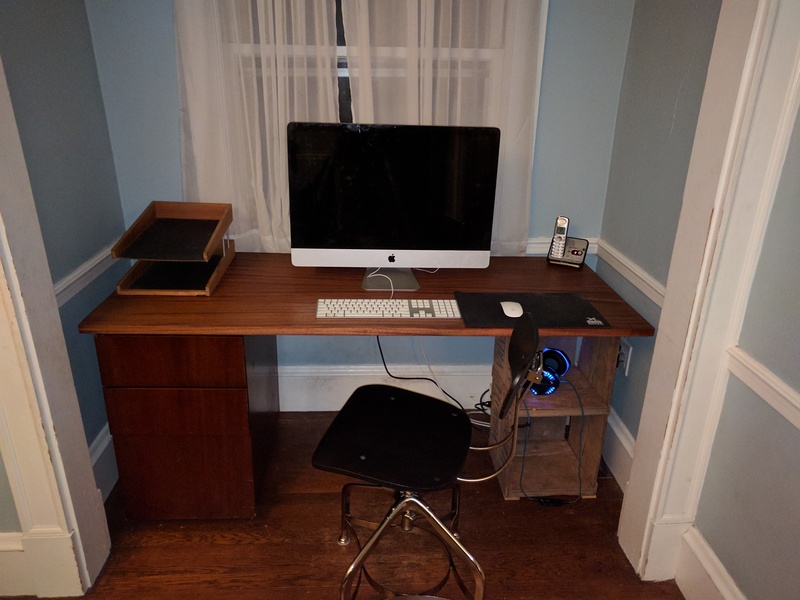 The new desktop was made of resawn (a woodworking term) sapele (a species of wood known colloquially as “African Mahogany”), an old file cabinet and a orange crate from the mid century. Fun to have a nice, clean platform on which to compute. In future posts, I will upgrade my 5 year old iMac to a brand new Windows 10 pc with a curved monitor and the Microsoft Sculpt keyboard and mouse suite. Along the way, I’d like to “design” a way to handle the -> right side so that the hardware is discreet, yet accessible. Turn the orange crate the other way?